Things are starting to warm up before the Final Four and the All Star teams will cause some debate amongst basketball fans in Europe. The First and Second All-Euroleague teams have been announced, with 10 players being acknowledged for their tremendous play in the season leading up to the Final Four. The players were selected by tens of thousands of fans from all around the world and media members from the countries where the Euroleague teams play. The voting process is carried out with respect to the normal positions that players play. The 10 players come from 7 different teams in the Euroleague and there are six players making their first ever appearance in one of these All-Euroleague Teams. This is a player that has won the Euroleague three times, he has been named the MVP in the Final Four three times and this is his fifth season in a row being named in one of the All-Euroleague teams. This is also the 7th time that Spanoulis has been acknowledged in this manner. This is the third time in the past 4 campaigns where he has been in the first team and in the two previous times, Spanoulis led his team to Euroleague glory. This is the sort of occurrence that fans love and there will be a great deal of expectation placed on Spanoulis for the rest of the tournament. He grabbed 34 points, which was a career best, in a win against Neptunas Klaipeda, during a period of form which saw him be named the MVP for October. Spanoulis achieved an average of 28 minutes per game (the leading player for his team), an average of 14.9 points per game, an average of 5.7 assists per game and a performance index rating of 15.5 per game. Teodosic may have started on the bench in a lot of games this season, but it has been one of his best with respect to the Euroleague. This has been a monumental season for CSKA Moscow so far and this is the fourth time that Teodosic has been honoured with an appearance in an All-Euroleague team, and his second in the first team. Teodosic of course was also the Euroleague MVP back in 2009/10. With Fenerbahce reaching their first ever Final Four, it was clear that their players stood out and Nemanja Bjelica has been in excellent form as his performance index rating of 18.3 indicates. He also led the Turkish team in rebounds, 8.6 per game and steals, 1.2 per game. He was second for scoring, with an average of 11.9 points per game, 0.7 blocks per game and fouls drawn, with 3.2 per game. Bjelica was the MVP for March and this is his first All-Euroleague performance in his fifth season in the Euroleague. Reyes may be 35 years old and averaging less than 20 minutes per game this season but he has still shown up every strongly with an average of 11.4 points, 5.5 rebounds and he has notched up a performance index rating of 14.5. He may not have made many minutes but the minutes he has played in has seen him be dominant. Reyes also marked himself out as the all-time leader with respect to total rebounds in this campaign, marking him out as one of the classy acts of the Euroleague. This has been a record breaking season for Marjanovic, and the tallest player in the Euroleague is well worthy of his inclusion in the first team. He has achieved the most rebounds of the campaign, a total of 256 and he has also achieved 16 double-doubles, the most in any season. With an average of 16.6 points, he has been the MVP of the week on three teams, showcasing his consistency. This is the first time that Boban has been included in the All-Euroleague selections. He may have been a newcomer, with this being the first time that De Colo has been included in the All-Euroleague team, but the combo guard has had a big team for a team that has had a very good season. De Colo is the leader for CSKA with respect to the performance index ranking, 16.8 per game, and steals. He has also served up 14.2 points per game while offering an average of 3.2 assists per game. Fernandez is such a strong player all over the court for Real Madrid and he has been a big factor in the Spanish side reaching the Final Four for the third season in a row. He has achieved a ranking of 16.4 in the performance index rating while also nothing an average of 13 points per game and an average of 3.4 assists per game. Fernandez was the MVP for February and he enjoyed a career high indez rating of 38, in a game against Barcelona, which is always pleasing for a Real Madrid man. This is the third year in a row that Fernandez has been recognised by the All-Euroleague selection process. Goudelock was the third ranked player with respect to scoring, 16.4 points per game and he has performed strongly throughout the course of the season. 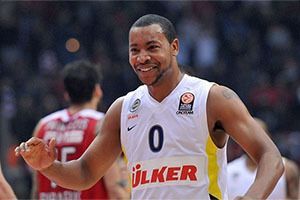 Goudelock was the MVP for last season’s Eurocup and he has stepped up with great confidence this season. The reigning champions have struggled this season but Devin Smith was still the main man for the Israeli side. He bagged a performance index rating of 16.1, he scored an average of 15 points per game and he offered up 6.1 rebounds per game. Smith was the MVP back in November and this is the first time he has been acknowledged by the All-Euroleague selection process. Tomic was the Barcelona leader with 18 per game in the performance index rating while he has also offered up an average of 11.5 per game and 7.1 rebounds per game. This is the third season in a row that Tomic has been included in an All-Euroleague team.